For our Remote Computer Health Checks, Remote Computer Support and Remote Computer & Software Training Services we prefer to use TeamViewer because it is quick and easy for you to get started with and offers a wealth of great features to help us help you. More than 100,000,000 Users spread over more than 200 countries already use TeamViewer. TeamViewer is ready to use, right after downloading! Download, execute, and get started! – Your first Remote session will start in less than a minute and by giving us your Remote Control User ID and Password we will then be able to connect to your Computer and give you Remote Computer Health Checks, Remote Computer Support or Remote Computer & Software Training. Below we have given instructions on downloading and running the TeamViewer Remote Control Software, all you need do is download and run it, it DOES NOT have to be installed permanently to your computer (although you could choose a Full Installation if required), however, it only needs to be run to setup a Remote Control Session between yourself and us. 1. Click the link and Download the TeamViewer_Setup.exe file to your Computer (i.e. on your Desktop). 2. Once downloaded locate and run the TeamViewer_Setup_en.exe file from the location where you saved it. 3. When you first run TeamViewer you will be asked the for the type of Installation, select Basic installation option and then Personal / Non-commercial use and click on the Accept – finish button to proceed. 4. You may receive a Windows Warning dialogue box like that below, you need to click on Yes to allow TeamViewer to run and execute on your Computer. (It’s perfectly safe to do so). 5. TeamViewer will now run and is ready for a Remote Control Session to be established with your Computer and the Window below will be displayed on your Screen, you need do nothing else but you need to ensure that you keep this Window Open and supply us with your Your ID and Password as shown in the ‘Allow Remote Control’ Section on your screen (you can do this by Telephone, Skype or email. We will then be able to connect to you once you have supplied us with this information. You MUST keep this Window open until we have connected to you and finished with the Remote Support session, if you close this dialogue box we WILL NOT be able to connect to you with the details you supplied! 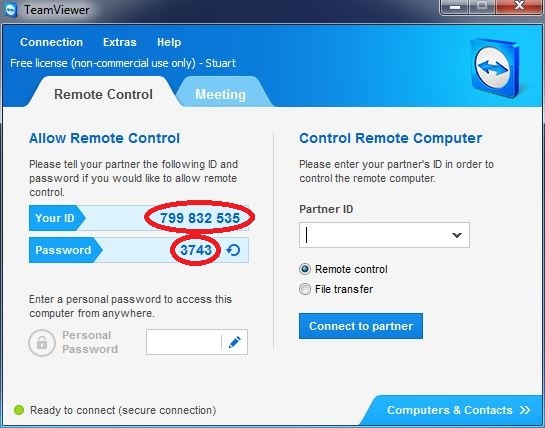 NOTE: Everytime that you Run TeamViewer the Remote Control Password generated will also be randomly changed! When we have established a Remote Control Session you will need to STOP using your Computer, you will however, be able to use the Chat Feature of the software to speak with us but mostly be able to sit back and watch whilst we work on your Computer. You may also be asked by the Remote Control Software to allow us certain Permissions to do things on your Computer so you will need to Accept or Allow these where applicable whilst you watch us working on your Computer. Once you are done with your Remote Control Session with us we will disconnect from your Computer and you can close the Window above and Shutdown the TeamViewer Remote Control Software. A more detailed procedure for you to follow prior to your Remote Support request will be sent to you by email when you make a request for us to provide you with Remote Support. If you keep the file you downloaded TeamViewer_Setup_en.exe on your Computer then you will be able to easily run it again for any future Remote Control Sessions you need to have with us, alternatively once done you can safely delete the TeamViewer_Setup_en.exe file and just return to this web page and follow this procedure again in the future if and when required. If you carried out a Full Installation of the TeamViewer Software then you can easily run it anytime in the future and the downloaded file TeamViewer_Setup_en.exe can also be safely deleted from your Computer!